Tablets and smartphones are devices that we have with us all the time. We have them in our pockets, bags, or just flying around somewhere in the car. And yes, they can break. That’s why most of us use protective cases, sleeves or covers. Some of these include nice features like, for instance, automatically unlocking or waking-up your device. Especially tablet cases and covers offer some sort of build-in stand mechanism, to easily watch videos or type on the tablet. There are many cases and covers available for the 2013 Nexus 7, ranging from a few bucks to over a $100. The obvious choice for me was the official Asus Premium Cover. Keep on reading to see if it’s worth the $35. 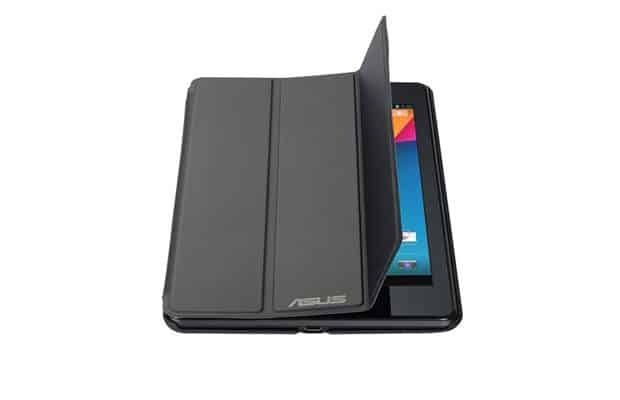 The Asus Premium Cover for Nexus 7 (2013) comes in a very slim design and two colors: black and white. It completely wraps around the tablet, protecting it from drop- and impact-damage. The foldable cover let’s you position your Nexus 7 in a video- and typing stand. At least in theory. But more on that later. The cover itself is really slim, light-weight and does not add too much thickness to the tablet. I don’t have any problems charging my Nexus 7 with a Qi-Charger while having it in the cover. The book-like feeling is great for reading and from what I can tell after using it for about a week, the tablet is protected very well. You can reach all buttons of the tablet easily and the cover does not block the camera, speakers or any other slots. The cover itself feels and looks very premium. 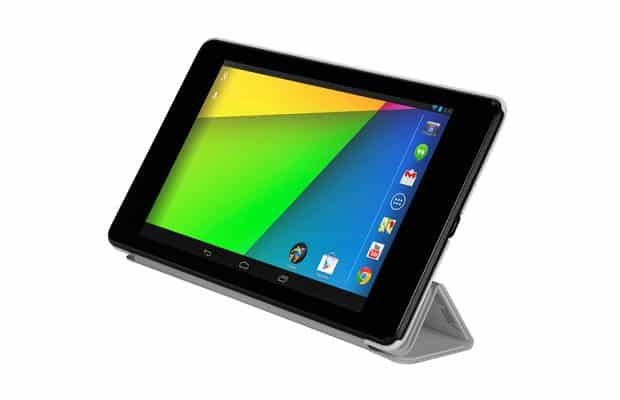 We have three Nexus 7 (2013) within our team including three Asus Premium Covers. While using them, we found that two out of our three covers don’t really fit. Although the sample size is kind of small, Amazon reviews show the same. The cover currently has a rating 2.5/5 stars based on 88 reviews. That’s really, really bad for an official case – or any other case. Another issue that we came across is the cover is only able to hold the tablet in the video stand position for a few minutes. Based on a few tests, the Premium Cover will hold the Nexus 7 for about 5-10 minutes before it flaps. This should not happen at all. In addition to that, the typing stand has issues to remain in the position on slightly inclined surfaces. This might not be an issue for everybody, but if you want to use your Nexus 7 during a lecture at your university, it might get annoying. Why Is There No Magnetic Lock & Unlock Feature? Although not officially advertised, the new Nexus 7 has a hidden magnetic lock / unlock functionality. An educated guess why this has not been advertised would be that Google and Asus are trying to protect themselves from a lawsuit from Apple. What I find really interesting about this is that many rather inexpensive covers and cases offer a magnetic lock & unlock feature, while the official Asus cover does not. Why would you include such a functionality when the official accessories don’t utilise it? The main purpose of the cover should be to protect the tablet from damage while keeping it clean. Unlike other covers, the Asus one is divided in three parts: Two cleaning microfiber and one rubber-coated. The two microfiber parts are doing a good job, but the rubber-coated miserably fails to keep the Nexus 7 clean. The rubber-coated part is made to protect the device from slipping away from the video stand position, which it also fails to do. Living in Europe, I had to wait a few months before I was able to buy the Asus Premium Cover for the Nexus 7 (2013). I have to admit that I’m rather disappointed, although I’m still using it – but not to its full extend. In my case, the case fits perfectly fine so it’s protecting my tablet very well. Yet still, the other flaws make the experience rather disappointing. The Asus Premium Cover is the official cover for the 2013 Nexus 7 and I really don’t understand why it has so many flaws. I would expect that from a $5 Chinese rip-off, but not from the official product. I can’t recommend buying this cover at this moment, hoping that Asus will update the cover and replace it for all early adopters. Do you have any experience with this cover or any other ones? What’s your favorite cover? Share your thoughts in the comment section below.